The organ in the Cathedral is a significant instrument, not only within the city and diocese of Peoria, but also in the overall context of early-twentieth-century American organ building. Tonally it is among the largest and most important instruments designed, scaled and voiced by a scion of the great 19th-20th century English organbuilding firm of Willis & Sons, namely, Henry Vincent Willis. Henry Vincent Willis worked in America for only a few years, and the few unaltered instruments for which he was tonally responsible are an important treasure. Mechanically however, it is generally typical of electromechanical action instruments. BACKGROUND: The organ is in almost original condition, save for the console and some small subsequent tonal changes. A replacement for the original console was installed in the 1980’s, and the reservoirs throughout the instrument were partially re-leathered. 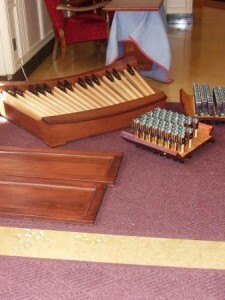 The colored tuning slides on the exposed Great pipework are not original, and also date from the 1980’s work. RATIONALE: This is a fine and important organ, one worthy of being put into the best possible condition; and it was deserving of selective enhancements that were in keeping with its historic character. Buzard Pipe Organ Builders’ special connection to the Willis firm provided a unique opportunity for the Cathedral to honor the pedigree of this very special instrument. The following work was accomplished beginning in 2007, and over the subsequent years, as an orchestrated, complete renovation of this organ. The existing console was removed and discarded. A new three-manual drawknob console with matching adjustable bench was constructed of 1-1/2” thick solid white oak and white oak veneer, with new keyboards plated in bone and ebony, and a new pedalboard with maple and high-impact plastic key tops. A new custom designed and built multiplex relay and combination action was installed in the console and within the organ chambers. The new relay was equipped with transposer, record/playback system, and all other state-of-the- art appurtenances. The new combination action features 100 levels of memory and individual memory storage for multiple organists. Preparation was made in the new equipment for tonal enhancements and additions, including a second console and an additional chancel division. The existing, deteriorated electropneumatic expression equipment was removed and discarded. Each of the four sets of expression shutters and frames were re-felted, shutter pins and bearing points lubricated, and each set of shutters connected together by a new trace. The shutters were then modified to allow them to open further. The new traces were connected to new electric action sixteen-stage expression engines. The two reservoirs for the Pedal 16’ Bombarde were properly and carefully re-leathered, and reinstalled. 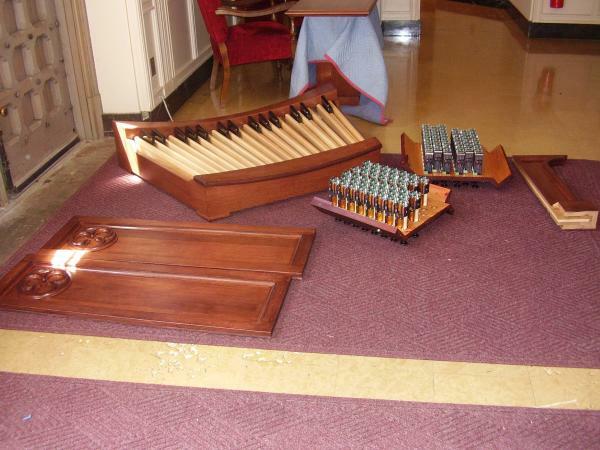 The rackboards for the Great 16’ Gemshorn, 8’ Open Diapason, 8’ Second Diapason, 8’ Trumpet, and 4’ Clarion, were replaced with material of proper thickness (they were too thin and weak). New European-style rack supports were custom-built and installed for all pipes 4’ and longer. The actual pipes were straightened and collapsed toes were replaced as necessary. New Walker electric equipment, including special high power amplification and speaker cabinets, were installed and connected to the new relay, to provide 32’ digital extensions to the Pedal 16’ Bourdon and Pedal 16’ Trombone. In the Great, the existing Mixture(s) were both unusual and unsatisfactory. There were, in fact, only two two-rank stops, despite the indications on the console drawknobs (III, III, and V!) The composition of these stops is outside any established norms for these important parts of the instrument’s primary principal chorus. Therefore, a new 2’ V-rank chorus Mixture in traditional Willis octave-breaking style was scaled, built, voiced, and installed on a new custom designed and built windchest, that complements and properly completes the existing Willis style Great principal chorus.